If you’re thinking of doing a short trip, there is no better place to go than Madrid! An unforgettable city that combines a special charm in cultural, artistic, sportive, gastronomic and entertainment levels. Even though the Spanish capital is full of special and symbolic spots, there are certain places that you just cannot miss out. Some examples include the Puerta del Sol, the Plaza Mayor or the Gran Vía. Without a shadow of a doubt, I cannot think of a better way to visit Madrid than being connected to the Internet. Not only did it allow me to stay in touch with my friends and family by sharing my favourite moments in the city, but also it allowed me to enjoy some of its advantages such as purchasing my tickets for the different museums and events in advance. There are many ways and routes to visit Madrid, but I highly recommend you to follow my steps through the streets of Madrid so you are sure you do not miss the best places in the city! Right after my arrival in the Spanish capital, I directly went to one of the most attractive places in Madrid, la Plaza de España, located in the heart of the city. It comes as no surprise that it is one of the most frequented places in the city since it is the perfect spot to get in touch with the dynamism and the activity of the centre of the city. After this first glimpse of the city, I decided to walk around the surrounding streets and was totally fascinated by the warm ambience that filled the streets. As it couldn’t have been different, I decided to enjoy my lunch break in one of the most traditional and popular restaurants in the area, la Bola, and taste some of the most traditional dishes of the city, the tapas and the cocido madrileño. A highly recommended dish that is both very tasty and that will definitely satisfy your hunger! After this amazing meal, I walked some more minutes to find myself right in front of the Palacio Real de Madrid, next to the Almudena Cathedral. Both of them are icons of the city and they are worth seeing in person in order to enjoy their structure and their amazing surrounding gardens. Only some minutes away, you will find one of the main square of the city, Sol, in which there is always a fun and warm environment with performances by street dancers and bands. In this same square, you will also find some of the typical symbols of the city such as the Statue of the Bear and the Strawberry Tree and the Zero Kilometre, that both are pictures that you have to have in order to claim that you have been in Madrid (and share it thanks to your portable wifi device!). 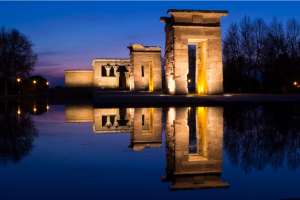 To wrap up the day, I went to one of the most unique places in Madrid to observe the sunset: the Oeste Park, where the Debod Temple is found. The charm of this place? Not only was the Temple a gift from Egypt in II A.C, which makes it a historic piece of art, but it is also one of the most special places to end the day. When the sun starts to set down, the Temple is lit up, which will for sure leave you speechless. The sun rises in Madrid and it was the perfect day to have a more cultural journey. Though many people tend to forget it, Madrid has some of the most emblematic and important pieces of art of the history of the country. 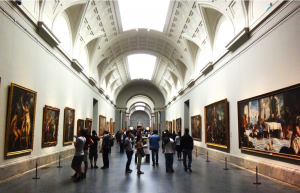 Additionally, the most important museums of the city, The National Museum Reina Sofía, the National Museum El Prado and the Thyssen Museum are all located along the same street, the Paseo del Prado, which leaves you with no excuse to miss out any of them! First, I went to the National Museum of the Reina Sofía. Though all of the pieces of art exposed in the gallery are incredible, the one that I personally found completely breathtaking was Pablo Picasso’s “El Guernica”. This is one of the most widely known Spanish painting but the feeling you get by seeing it in person cannot be compared to the sensation you get from just seeing it on the Internet or in a book. It is definitely worth taking some time to observe every single detail of the most symbolic paintings of the Spanish Civil War. I obviously could not leave without visiting neither of the two other museums, so after my visit to the National Museum Reina Sofía, I headed to the National Museum El Prado in which you can see some very important Spanish paintings such as “Las Meninas” from Velazquez or “Los Fusilamientos” of Goya among others. Then, the Thyssen Museum has some amazing temporary expositions by artists of great relevance such as Pablo Picasso or Andy Warhol so no matter whether you prefer classic or modern art, this museum will for sure please you. Buy your tickets online to avoid the endless queues at the the entrance of the museums! 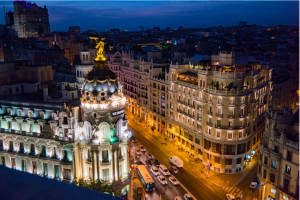 After a cultural journey in Madrid, there is no better way to take a break than enjoying the Madrid nightlife in the rooftop of the Circulo de Bellas Artes. In this rooftop, you will be able to enjoy an incomparable panoramic view of the city, accompanied with some cocktails and chill music. A perfect place to relax and meet other travellers and locals while enjoying the best views of the city! 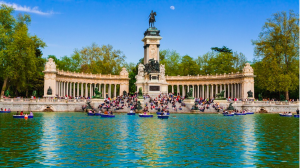 Sadly, my last day in this amazing city had come and there were still some places that I was craving to see before departing, so I spent the morning in the park that “brings life to the city”, the Buen Retiro Park. This park has nothing to do with any other park that you have visited before. In it, you will find amazing spots such as the Rosaleda or the Cristal Palace. You will be for sure be enchanted (or at least so was I) by its structural beauty both inside and out. Also, to enjoy the great weather you will probably have during your stay, the best thing to do is rent one of the little boats in the park, where you will make funny memories for sure! ernabéu. 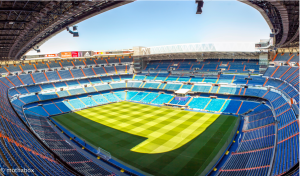 In fact, Madrid has two main professional soccer teams, the Real Madrid and the Atlético de Madrid, with their respective stadiums, the Santiago Bernabéu Stadium and the Vicente Calderón Stadium. If you have the chance to assist to a soccer game in the capital, you cannot miss that unique opportunity! The atmosphere, the crowds singing and the tension that are concentrated in the stadiums during the games will make you live an incredible evening that will be hard to forget. However, if you are not lucky enough to get tickets for a game, don’t worry! You can always join the fans’ party in the Plaza Cibeles or the Plaza Neptuno in which you will see the most fun and fanatic side of the city. Madrid is not only a very dynamic and welcoming city, but it is also characterised by its cultural beauty. Full of charm in every corner, Madrid is an international reference that you just cannot miss. Without any doubt, you will make unique memories in the city that will leave you wanting more! To make the most out of your stay in this incredible city, do not forget your Portable Wifi Spain’s device to enjoy all the benefits of travelling always connected in the Spanish capital!